World No Tobacco Day: Marching to Big Tobacco’s tune? Cross-posted with the Uncounted blog, by TJN’s research director Alex Cobham. Has World No Tobacco Day 2015 – this Sunday – been manipulated by Big Tobacco’s lobbying agenda? Where the tobacco lobby is concerned, it would be naive to think there’s smoke without fire. One of the dirtier secrets of the international tax world – and yes, the bar is quite high – is the role of tobacco companies in seeking to manipulate policies that might reduce the number of people smoking dying because they consume tobacco. The main angle taken by the lobby has been to direct attention towards ‘illicit’ tobacco, where customs duties and tax may not have been paid. Now I care a lot about tax, but even I can see that whether tobacco was taxed before being consumed is barely even a second-order issue, when compared to the question of whether people are dying because of their consumption – which they are, and will continue to do, in their millions. But the thematic focus of the World Health Organisation’s World No Tobacco Day 2015 is not directly on stopping tobacco consumption, as the name might suggest. Instead it turns out to be… ‘Stop the illicit trade in tobacco products‘. This is a long post, looking at the human impact of tobacco consumption, the role of the tobacco lobby, and the substantive basis for arguments to address ‘illicit’ tobacco trade. First, while the WHO has sought to resist Big Tobacco, it seems that the focus of World No Tobacco Day is nonetheless a reflection of the lobby’s concerted efforts to shift policy attention away from measures that cut consumption (and death). Second, the tobacco lobby benefits from the effective support – inadvertent or otherwise – of some major players (corporate and individual) in international tax, who should be taking a long, hard look at their role. Tobacco kills. And overwhelmingly, it kills poorer rather than richer people; and as time goes by, it kills people in poorer rather than richer countries. My former Center for Global Development colleague Bill Savedoff has been doing great work highlighting the human and development cost of tobacco – see e.g. his latest blog and a great podcast, from which this section draws. Overall, the study suggests that smoking may be responsible for a quarter of deaths of those aged 25-69. 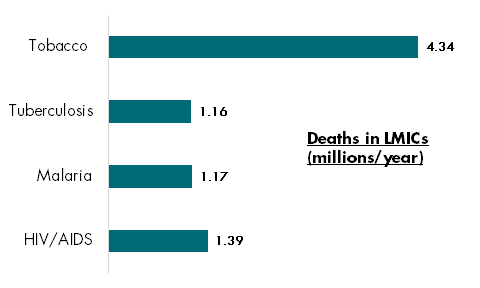 But it is in lower-income countries where most smokers and other tobacco consumers are, and will be – and the same for tobacco-related deaths (data from Tobacco Atlas, figure from CGD). Over 4 million a year, more than TB, malaria and HIV/AIDS combined. And the costs are likely only to rise, since the number of daily smokers continues to grow, from 721 million in 1980 to 967 million in 2012 (despite a drop in smoking prevalence). “A tobacco-industry funded lobby group will attempt to derail a World Health Organisation summit aimed at agreeing increased taxes on smoking, according to leaked documents seen by the Financial Times. This is damning. With such a position taken by a major UN body, the ITIC cannot be seen as legitimate in its claim to provide objective analysis to governments around the world. But within the tax sphere, many leading actors work with the ITIC. As the Observer highlighted, the former permanent secretary of HM Revenue and Customs (head of the UK tax authority) became a director of ITIC just a year after stepping down. His justification, given to the paper, was that he is not an executive director and is unpaid; and that around 50 other “leading figures in taxation” are involved in the same way. The ITIC’s ‘Senior Advisors‘ list is certainly an impressive one from the tax perspective, including a number of respected researchers and tax officials, with Jeffrey Owens – former head of the OECD’s tax arm, the Centre for Tax Policy and Administration – singled out as a ‘Distinguished Fellow’. I haven’t spoken with any of these people about ITIC, and can only imagine (and hope) that they simply haven’t registered that the ITIC is a tobacco lobby group. The ITIC certainly doesn’t present itself as such. Similarly, it’s unclear why non-tobacco multinationals like Goldman Sachs or ExxonMobil would want to associate themselves with this lobby, not to mention the professional services firms which include big 4 accounting firms, and lawyers such as Pinsent Masons. But commercial organisations of this size can surely promote such an environment without the taint of tobacco lobbying. There could hardly be a clearer message for the sponsors and fellows to find an alternative to the ITIC, than for a major UN organisation like the WHO actively warning governments not even to engage with it. So far you might say I’ve played the man, rather than the ball. What about the substantive basis for the arguments made by the ITIC? I’m all for development, and the curtailing of illicit financial flows. But does this position stand up to scrutiny? Arguments along these lines have been used in seeking to influence tax policy – that is, against higher tobacco taxes – from Ukraine to the Philippines, with critics arguing that the estimates provided tend to systematically overstate the case. And as Bill Savedoff highlights in this CGD podcast, the broader evidence simply does not support the claim that higher tobacco taxes lead to illicit tobacco trade. Significant tax rises over the last 10-15 years have not been associated with any increase in the proportion of tobacco that is illicit (about 9%-11%). Other factors like enforcement and effective tax administration seem much more important. Essentially, to get the magnitude of smuggling that you would need, to have an impact on the tobacco tax, or consumption, you have to have the complicity, if not the actual responsibility, of the tobacco companies themselves. Bill also shreds the claim that tobacco taxation is regressive. In fact the majority of tobacco tax revenues will come from richer, not poorer people. And the behavioural responses mean that poorer people benefit disproportionately in health terms. So this is that rare thing, a sales tax which is progressive – and powerfully so. Finally Bill, and also Michal Stoklosa of the American Cancer Society in this great Tobacco Atlas piece, argue that tobacco taxation has been shown to be the most effective tool to reduce tobacco consumption. There is no doubt that illicit trade in tobacco exists; and nobody argues it’s a good thing. But it’s clearly not the big issue about tobacco consumption – that would be, er, tobacco consumption. Should the WHO then use their biggest awareness-raising moment of the year to focus on illicit trade? From the outside, it seems clear that ‘No Tobacco’ would have found a stronger expression in a theme that sought to reduce all tobacco consumption. I don’t mean to suggest anything illicit in the WHO’s adoption of this theme. Clearly they have taken a very direct stance against the well-funded lobbying of the ITIC. But if we ask whether this theme would have been chosen, absent ITIC lobbying over recent years, it seems likely the answer is no. I hope the WTO can stick to the mission of the day – that is, of No Tobacco. For now, chalk one up for the ITIC. But then ask: Of the many individuals; the chairmen, co-chairmen and directors; and the professional services firms and non-tobacco multinationals that are working with the ITIC, how many would see this as a win? Do they each mean to lend their names and reputation to an organisation that has consistently lobbied individual governments, especially in developing countries, and international organisations, against tax measures that are proven to reduce tobacco consumption, and all the health damage and needless death that results? 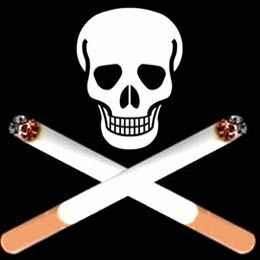 If not – and I very much hope not – then World No Tobacco Day 2015 seems like a fine time to step away from the ITIC. Should we be giving tax breaks to tobacco companies?